Hello again blog fans. By way of reminder, in honor of the holidays I am giving away a book each Friday until December 16th. That means that if you are a reader of this blog and either want a book for yourself or to put under the tree for someone special, you have three chances to win before Christmas. Last week I gave away Ben Witherington's - The Indelible Image: The Theological and Ethical Thought World of the New Testament Vol. One which was won by Mike Suh. A 2005 Gold Medallion finalist! Some introductions to the New Testament highlight the historical contexts in which the New Testament literature was written. This introduction gives particular attention to the social, cultural and rhetorical contexts of the New Testament authors and their writings. 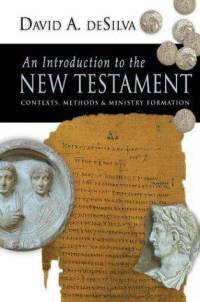 Few introductions to the New Testament integrate instruction in exegetical and interpretive strategies with their customary considerations of authorship, dating, audience and message. This introduction capitalizes on the opportunities, introducing students to a relevant facet of interpretation with each portion of New Testament literature. Rarely do introductions to the New Testament approach their task mindful of the needs of students preparing for ministry. This introduction is explicit in doing so, assuming as it does that the New Testament itself--in its parts and as a whole--is a pastoral response. Each chapter on the New Testament literature closes with a discussion of the implications for ministry formation. These integrative features alone would distinguish this introduction from others. But in addition, its pages brim with maps, photos, points of interest and aids to learning. Separate chapters explore the historical and cultural environment of the New Testament era, the nature of the Gospels and the quest for the historical Jesus, and the life of Paul. This introduction by David A. deSilva sets a new standard for its genre and is bound to appeal to many who believe that the New Testament should be introduced as if both scholarship and ministry mattered. Winners will be selected on the Sunday following the Friday the book is posted. As always, the winner has five days to claim their book once their name has been posted. All unclaimed books go back on the shelf. Leave your name below and check back on Sunday. Don't forget that next Friday I will be giving away a copy of N.T. Wright's - The Resurrection of the Son of God (Fortress, 2003). Jonathan Kung. Wow, this book is great! Adam Parker, thanks so much!